Our mission is to provide you with superior logistical and transportation support – designed for each account with attention to detail and cost. From our Red Wing, MN headquarters, we serve inbound or outbound and dedicated or expedited routes to efficiently reach your customers and vendors – whether they’re local, Twin Cities metro, Southeast Minnesota, Western Wisconsin, Midwest Regional, contiguous United States, or international. 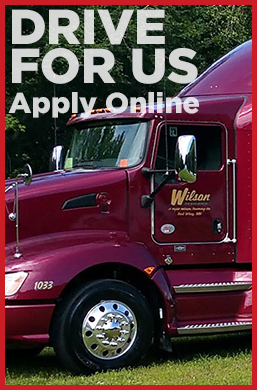 Founded in 1992, Wylie Wilson Trucking, Inc. continues the Wilson family business that brings together more than 100 years of trucking industry expertise. Today, our highly-trained personnel offer wide-ranging experiences and capacities – executing the the most-effective practices, technologies, and communication – all toward the benefit of your bottom line. We proactively maintain and regularly upgrade our equipment – late-model tractors, 53-foot dry vans, intermodal container chassis, ﬂatbeds, temperature-controlled trailers, and more – to provide dependable, flexible transportation solutions for any sized operation – from the multinational manufacturer’s supply chain management to your family’s next move. Across its divisions and subsidiaries, the team at Wylie Wilson Trucking, Inc. has the business intelligence to know your sector well and to help address all the industry-specific transportation challenges you face. Our fleet is equipped with the latest communications technology that provides continuous system information updates – allowing our dispatch managers to quickly know if a change in scheduling is required. Or if you have a question about your load or need to book another shipment, Wylie Wilson Trucking’s considerate and professional account representatives are always just a phone call away.